ARCO Guesthouse is situated in a quiet sidestreet in Prague’s district 10, Vršovice. The street is not very conspicuous, but you will be surprised about the interesting neighbourhood. Walk up Donská street, turn left at the next corner and walk up Kozácká street and bump into the main entrance of Groebe Park, officially called Havlíčkový sady. It’s a wonderfully romantic park with a grotto, a café and a winery, a beautiful wooden pavilion, ideally located at the Southern slope of the garden with a view and the vineyard right below it. The building in its centre is the former villa of a German Jewish millionaire who made his money with railway construction. At the corner of Donská and Krymská streets, one block uphill, you find Plevel, a simple but good vegan restaurant which our guests (and I) recommend. Down Krymská street you find, among other places, The Café v lese, the café in the woods, a beer pub with a cellar for mostly alternative live gigs. It’s owner is also the initiator of the pianinos and chess tables you find in various locations around the city. Turn right at Černomořská to bump into Café Sladkovský, a pretty and friendly coffeehouse for all generations, alternative food and some live music every now and then. On Francouzská street, on your left when coming from Donská, you bump into old fashiond and cosy Café Šlagr – gorgeous cakes! For traditional Czech cuisine you need to walk a 150 metres farther uphill to find U Bulínu restaurant with good reviews and an interesting interior. For fine dining you have two options: You walk up Donská street to the next corner, turn left at Kozácká street and pass Groebe park – Havlíčkový sady on your left, continue along Koperníkova street and turn left at Jana Masaryka street (downhill) till you bump into Le Palais hotel. The other option is to go to the Blue Wagon restaurant, a new, rather minimalistic place with very good reviews at the coner of Varšavska and Uruguayská streets. The easiest way to get there is to walk up Francouzská street, direction downtown, for about 700 metres and turn left at Uruguayská street. If after walking up Donská street you cross Francouszká street you find a little staircase leading to a park. Cross the park, turn half right and cross the street to get to another park, Bezručovy sady, with a Hussite church on the right from the late 1920ies and a street that leads to an almost suburban settlement of upscale villas from the late 19th and early 20th centuries. Continuing along to park in the direction of Korunní street you will discover Vinohrady’s old water tower. 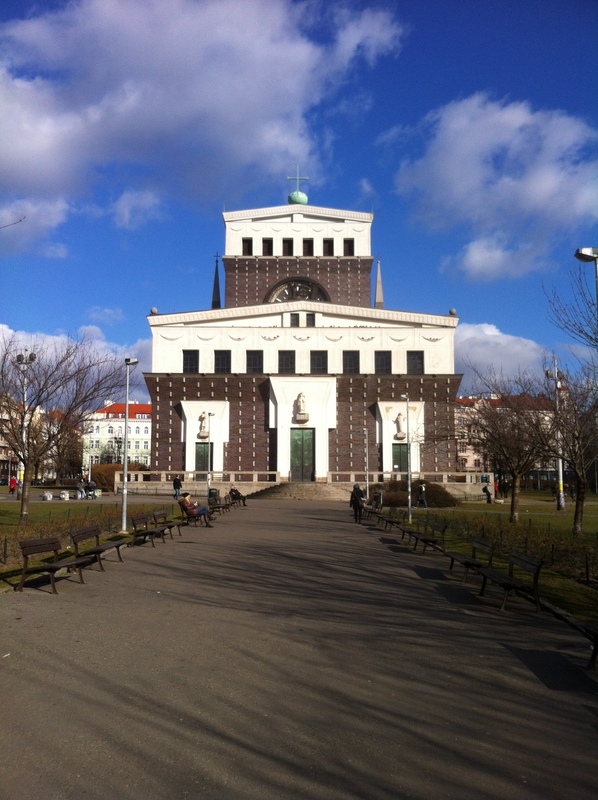 Vinohrady is the name of large parts of Prague’s 2nd district. It means vineyards – one of two of Prague’s remaining vineyards is the one mentioned above, dating back to the 14th century. 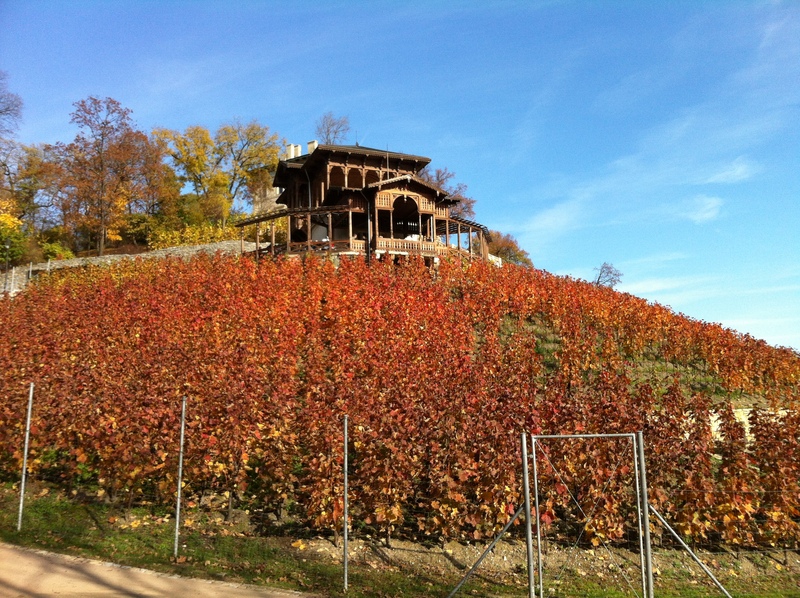 Then Prague was surrounded by numerous vineyards. Walk on downhill through the next park until you reach Vinohradská street. At the right corner in front of you you will see a square named Jiřího z Poděbrad with a church, and if you happen to have your walk between Wednesday and Saturday, you will discover a street market at the Northern edge of the square. The church of the Most Sacred Heart of our Lord is one of the most important creations of Austro-Slovenian architect Jože Plečnik from 1932. It’s attractive exterior and even more it’s awesome interior cannot anymore be attributed to Art Nouveau, but certain elements seem close. The church is open to the public only for services (Weekdays at 8 a.m. and 6 p.m., Sundays at 9 and 11 a.m. and at 6 p.m.). The farmers’ market is a typical lively neighbourhood market – hardly any tourists, local produce, drinks, improvised cafés, live music on Saturdays. Very recommended. Prague has lots of small grocery shops that mostly open every day from 7 or 8 a.m. till 10 or 11 p.m. One of them is right around the corner of Donská and Voroněšská streets, up the street on your left before you reach the tram stop. Crossing Havlíčkový sady (see above) you get to a larger LIDL supermarket. Some shops in our neighbourhood (except for the groceries) close on Saturday afternoon and on Sunday. Contrary to that you have a 24/7 grocery and convenience store at the corner of Francouszká and Uruguayská streets, close to náměstí Míru square. At the corner of náměstí Míru and Belgická street you find a 24/7 pharmacy. N.B. : A pharmacy in Europe sells medication, some of it only on precscription, whereas a drugstore like DM on Francouszká street sells cosmetics, detergents, beauty stuff and some health food.